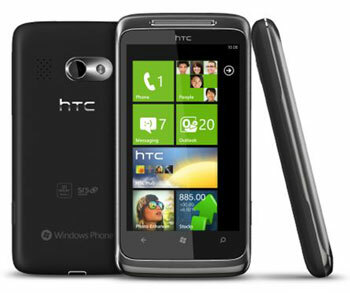 When the HTC 7 Surround for AT&T ($200) goes on sale November 8, 2010, it will be one of the first Windows Phone 7 devices available for the U.S. market, debuting alongside the LG Quantum and Samsung Focus. All of the Windows Phone 7 phones that have been announced will have a capacitive touchscreen, 5MP camera, 1Ghz Snapdragon processor. So what is the HTC 7 Surround's standout feature? 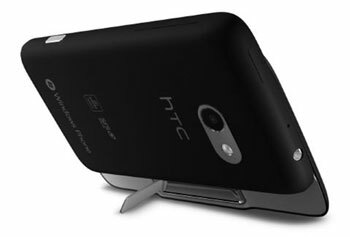 The HTC 7 has an integrated, forward-facing slide-out speaker bar and a built-in kickstand that aims to make it a mini media center. I've spent much of the last week hands-on with the HTC 7 Surround and have come away with an appreciation for the potential of Windows Phone 7. But that appreciation does not carry over, for the most part, to the HTC 7 Surround. The added weight of the HTC 7's speaker, along with a just average 3.8-inch LCD screen, cause me to question whether the phone will find its place within the Windows Phone 7 lineup. For the media obsessed, the Samsung Focus' beautiful 4-inch Super AMOLED display and HTC's own HD7's 4.3-inch screen will likely be better options. The HTC 7 Surround is a solidly built phone with a rubberized back that makes it feel secure in your hand and a nice metal trim that adds a touch of class. Thanks to the slide-out speaker, it’s heavy though, weighing in at 5.82 ounces, especially given its relatively small 3.8-inch display. By contrast, the Samsung Focus with a 4-inch display comes in at a svelte 4.1 ounces. And even the HTC HD7, with a 4.3-inch display, is lighter at 5.7 ounces. In my opinion, the weight trade-off for the slide-out speaker bar was a poor one. The display on the HTC 7 Surround is a standard 3.8-inch capacitive LCD touchscreen. It’s bigger than the Apple iPhone 4 (3.5 inches), but on the small side when compared to other Windows Phone 7 devices and many Android devices, like the Samsung Vibrant (4 inches) or Motorola’s DROID X and HTC’s EVO (both 4.3 inches). Given that the HTC 7 is positioned as a media-centered device, it seems odd that this is all we get. The built-in kickstand is great for watching video hands-free and the slide-out speaker bar means the audio isn't obstructed, which can be problematic with other phones. But in my side-by-side testing against the iPhone and Samsung Epic 4G , the HTC 7 Surround only provided marginally better sound. The Windows Phone 7 operating system handles all the smartphone basics well, and in some cases admirably. What makes Windows Phone 7 different from its competition? It starts, appropriately enough, on the Start screen where the customizable app tiles contain usable information rather than just a pretty icon. And deeper in, it works to bubble up useful information and functions that cross app lines. Currently, the apps are largely missing, though Microsoft assures us that there will be plenty at launch, though not the quantity of Apple’s iOS 4, Android or even Blackberry. I also like the way Windows Phone 7 anticipates your next move and provides an easy means of getting there. For instance, in the calendar you can move from an appointment to a map of the meeting location to driving directions without actively changing apps. When you look up a contact, you can see their latest status updates and even comment right there and have it post back to Facebook. And the camera is always one button push away—even when the phone is locked and in standby. After taking those spontaneous shots, you can share them right from the preview screen or set the phone to post all your photos to an online account automatically. For those of us who use our phones for work, Windows Phone 7 offers built-in support for Office files—Word, Excel, PowerPoint and OneNote. Opening an attachment from email, viewing and editing the document was about as easy as can be expected from a mobile phone. There’s no cut-and-paste, though, so heavy editing can be a pain. Cut-and-paste has been promised by Microsoft for 2011. One big disappointment with Windows Phone 7 is the lack of true multitasking, which means you can’t run third party music apps in the background. You can play tracks using the Zune player while checking email, but not Slacker Radio. To learn more, see our review of Windows Phone 7. Like the iPhone and many Android devices, the HTC 7 Surround doesn’t support Flash, which means that on some sites you won’t be able to play videos or interact with some aspects of the navigation. There’s a YouTube app planned, which should support video playback if the site uses iFrame, but it wasn’t available at the time of this review. Adding bookmarks and opening multiple tabs is easy, but you can only have six tabs open at any given time. 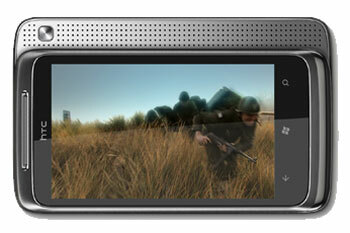 The HTC 7 Surround has a 5MP camera with an LED flash and takes 720p HD video. The camera takes good indoor shots for a cell phone, even in fairly low light without the flash. Good thing too, since the flash is fairly useless, lending a ghastly glow to skin tones and providing spot illumination. I’d only use it if it was the only way to get the shot. The controls are fairly basic and easy to use. You can adjust metering, turn on and off the flash, select visual effects (grayscale, negative, sepia and solarize) and select scene modes. When selecting a scene mode or effect, there’s a small strip of the viewfinder visible so you can see how it will affect your shot, which is very helpful. The HTC 7 Surround’s onscreen keyboard is very easy to use. It has very gentle haptic feedback, which I like, but it can’t be turned off if you don’t. It also has a word suggestion bar that updates as you type and will autocorrect your mistakes. It was surprisingly accurate. You can also go back and tap on a word and it will pull up the same suggested word bar so you can make a substitution. Navigation consists of the start screen, which you can customize with your favorite apps, contacts, music—pretty much anything, and second screen with a full list of apps. Within apps there are usually multiple screens plus a navigation bar at the bottom with context sensitive buttons and a menu icon that brings up addition options. The buttons are fairly small, which might cause some problems for those with large fingers. The HTC 7 Surround comes with 16GB of onboard memory, which should be plenty for most people, but no memory card slot for expansion. Under normal (for me) conditions with occasional calls, web browsing and app usage, the HTC 7 Surround lasted me through the day. The HTC 7 Surround will be available at wireless.att.com for $199.99 with a new, two-year customer agreement. When compared to the other Windows Phone 7 devices, the HTC 7 Surround doesn’t shine. And when you broaden the choices to Apple and Android, my view is that the HTC 7 will be lost in the crowd. The HTC 7's speaker bar delivers better but not much better sound, and it adds considerable weight and bulk to the device. And don't most people use headphones, anyway? The kickstand is also nice, but other Windows Phone 7 devices with larger displays and kickstands will be available shortly after, including the HTC 7HD for T-Mobile due in mid-November. And there are plenty of Android devices which offer more attractive displays, including the Motorola Droid X, Samsung Galaxy S line, and HTC EVO. In all other regards, the HTC 7 Surround is simply average. And I just don't think average is going to cut it anymore.